Just 10 years ago, an expedition of biologists came across a very strange group of cave-dwelling, bat-munching dwarf crocodiles living within Gabon’s Abanda cave system. As explained in the team’s 2016 study in the journal African Journal of Ecology, these crocs have turned a vibrant orange color to adapt to their new way of life in the dank and dark caves. This color-change is quite the opposite of what you would expect, as most animals tend to lose their pigment in the absence of light. However, the researchers who discovered these crocodiles believe that the orange coloration is a result of the urea in bat poop gradually affecting the skin. Unlike the above-ground populations of African dwarf crocodiles, the cave crocodiles have lost most of their vision. After all, there isn’t much need for if you spend the majority of your life in the near-pitch black. Food is pretty scarce down in the caves, so these crocodiles have learned to live on a diet of bats, algae, and crickets. Outside crocodiles, on the other hand, enjoy a diet of shrimps, crabs, frogs, and freshwater insects. It isn’t clear how many of these orange dwarf crocodiles exist. During two Abanda expeditions in 2010 and 2011, the researchers observed twenty individuals in the caves, although this estimation was only made after exploring a small portion of the cave system, so there is almost certainly more individuals to be discovered. 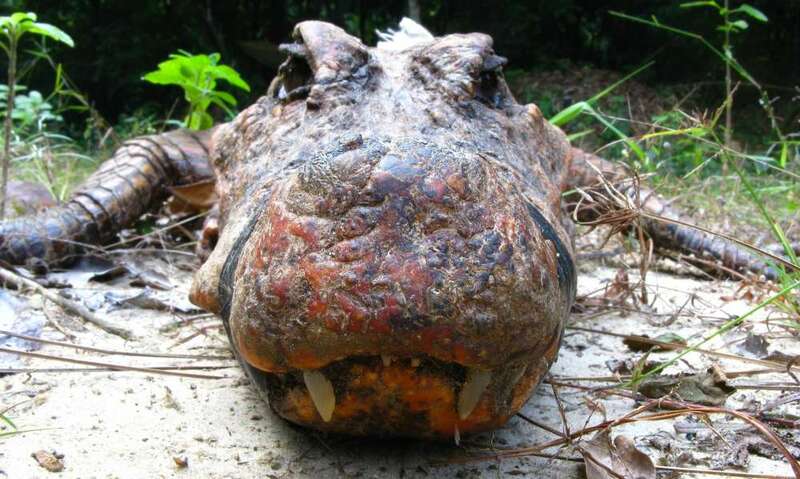 Initial DNA analysis in 2010 showed a “genetic difference of a few percents” between the cave-dwelling crocodiles and the others living in Gabon. The researchers claim this shows they have been living in the caves for several thousand years and only venture out during the wet season to breed. The recent analysis of the genetics suggests that the cave-dwellers have one different haplotype (a set of genes that were inherited together from one of the parents) to the non-cave-dwelling crocodiles. “We could say that we have a mutating species, because [the cave crocodile] already has a different [genetic] haplotype,” Richard Oslisly, who first discovered the cave crocs in 2008, told The Guardian. The new genetic analysis raises more questions about their breeding habits and how often they leave the caves. Equally, if they are able to get out of the cave, why do they spend most of their time down there? It's likely to be the threat of human activity in the surrounding area, however, like much of this crocodile's life, it remains a mystery for now.